Jim McCorry says he had no option but to resign as Down football boss after his position had been left "untenable". The Armagh native stepped down from the job after only one season in charge last Thursday. McCorry said backing from Down's clubs wasn't enough for him to stay after the county's management committee withdrew their support for him in early July. "It really made the position untenable and I had to step down," said the former Down manager. "I worked with the Council for 32 years and it would be like the council themselves saying, 'we want you to stay on as a council officer', but the chief Executive and the directors saying: 'We don't. We want you sacked'." McCorry departed from the Down job despite guiding the county to promotion to Division 1 in the Football League. However, the Mourne County lost both their championship games against Derry and Wexford and that ultimately sealed McCorry's fate. McCorry believes too much emphasis was placed on the disappointing qualifier defeat by Wexford. "I had two separate meetings with the county executive, and when we had the review, really the whole focus was on the Wexford result. "We didn't cover much about Derry and the fact that we had lost a man at half-time, and very narrowly lost that game." McCorry says positives such as the promotion to Division 1 were also discussed, but that the strengths of this were lost on county board officials. "I was told that's not what is in people's minds. People's minds are on the last three games which you lost," he said. McCorry added that he also came in for pressure from certain quarters in relation to a number of players who had made themselves unavailable for selection. The former Down manager claimed members of his panel had indicated that players who had opted out should not be invited back after being unable to commit to the squad earlier in the season. "Comments were made to me repeatedly that you should make an effort to get these players back in," he said. "I made it quite clear that if you want to play for your county you commit 100% along with the rest of the players. "I asked the players in the current squad three times this year did they want me to consider players to be brought back in, that weren't making themselves available. "The players made it clear that they didn't. The last time I said, the captain came back to me and said 'none of the players want them back at this stage, but that some of them would quit if they did (come back)'. "Those are the principles you stick by." McCorry added that he has no problem with players taking "time out" from the rigours of an inter-county set-up, and is delighted Dan Gordon and Marty Clarke will be back next year. "I've no problem with players taking a break for the McKenna Cup or the league and coming back, and people point to players like Bernard Brogan. "No one wanted that or even asked for it." 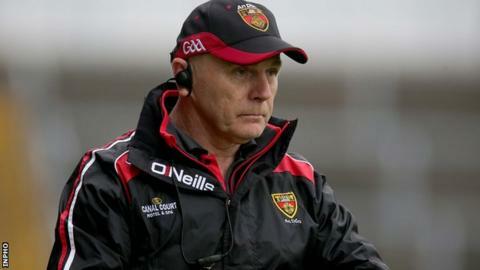 In a statement following McCorry's resignation last week, the Down county board said they had met McCorry to "reassure him he had 100 per cent support". The added said they had assured him that Down GAA "would not be found wanting in their support for Jim and the Down senior footballers in 2016 and beyond".